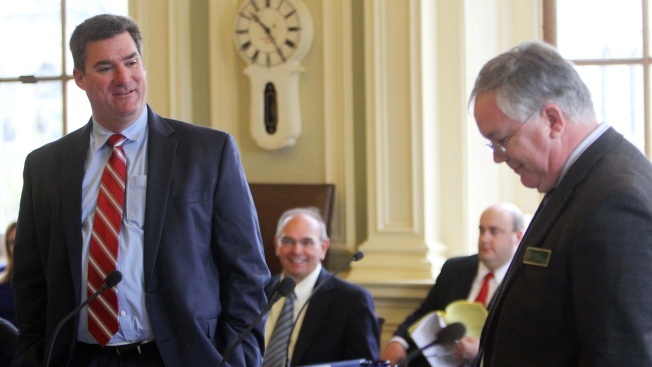 New Hampshire Sen. Andy Sanborn, R-Henniker, left, and Sen. Ray White, R-Bedford, Wednesday, May 2, 2012. A New Hampshire state senator says he's running for Congress. Andy Sanborn, a Republican from Bedford, said Tuesday he's established himself as the "conservative conscience" of the senate, while always voting with his district, at times defying party leadership. He's running for the 1st Congressional District. The seat is currently occupied by Democrat Carol Shea-Porter, who defeated Republican Rep. Frank Guinta in November. The 54-year-old Sanborn is a four-time state senator who is chairman of the Senate Ways and Means Committee. He and his wife, Laurie Sanborn, a state representative, own a Concord restaurant and are involved in financial consulting and real estate development. Eddie Edwards, a Republican and former chief of enforcement with the New Hampshire Liquor Commission, announced his candidacy for the seat in April. A spokeswoman for Shea-Porter declined to comment.